Sony Creative Software have today announced that Sony Vegas Pro 12 will be released in the Fall of 2012 without mentioning a specific release date. The news was broken at IBC on Sept 7th, 2012. The all new version of Vegas will sport some brand new and also improved features upon its release. 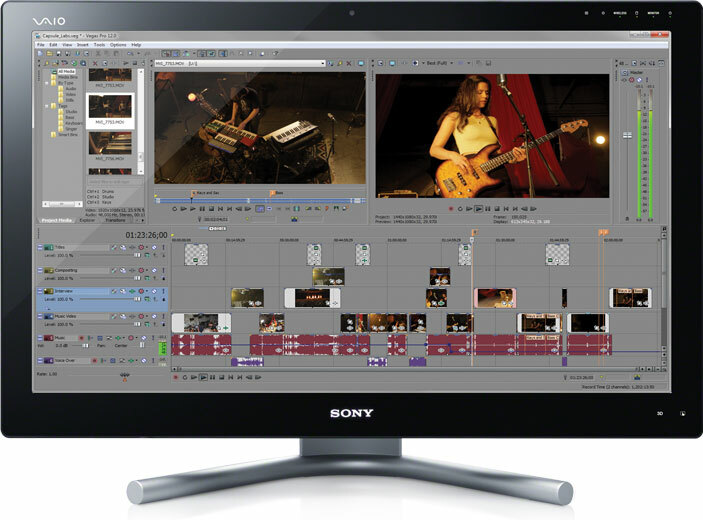 Not only that, but Sony Creative Software have announced “Sony Vegas Pro Edit”. Sony Vegas Pro Edit will feature the same audio and video toolset of Sony Vegas Pro 12, but will not feature the disc-authoring components. This is done to create a most cost effective package. There have been no prices released at this point, but we expect that Sony Vegas Pro 12 will retail for $599 (similar to previous versions) and Sony Vegas Pro Edit will retail around the price-point of between $299 and $399, but we could be wrong. Expanded Edit Mode – This mode allows you to see the “adjacent frames of the events at the edit point”. If you double click at the edit point in your timeline you get what SCS are calling an “A-B Roll” view (see image). 64 bit Audio Plug-ins – Sound Forge Pro plug-ins have been re-written to be compatible with 64 bit Sony Vegas Pro 12. Project Interchange – You can now (finally) import and export a wide range of files to and from Sony Vegas Pro 12 with some of the other popular video editors. Vegas can now convert between .veg (Sony Vegas project files) and AAF files (Avid Pro Tools 10), XML files (Apple Final Cut Pro 7, Final Cut Pro X – export only for Pro X) and .prproj (Adobe Premiere , After Effects CS6). Color Match – You can now match colors between two clips. You can choose a preset from the drop down list or simply use the Image Source controls to choose the image that you want to match. FX Masking (yes!) – Instead of having to mask the image/video itself you can now mask an effect. One great use that SCS have highlighted is the use of this effect for blurring out logos/faces/license plates/etc.. without having to mask the image/video. Shape Masking Tools – New Rectangle/Square and Circle/Oval masking tools make it easier to mask your video or image by drawing the shape over the video or image. Vegas Pro Explorer Redesign – The new re-design for the Vegas Pro Explorer features a thumbnail view, support for Windows libraries (My Music, My Pictures, My Videos) and auto-text fill and “Breadcrumb Control” allowing you to navigate to previous directories of your system. Edit Properties for Multiple Video Files – You can edit properties, for multiple clips, including pixel aspect ratio, color space, stereoscopic 3D mode, field order and more! I am personally excited about the Project Interchange, FX masking/shape masking and the Layer Dimensionality Video FX. I think the Project Interchange was a much needed addition to the Sony Vegas Pro software. This will allow for much easier and quicker workflow between other editing programs. This was a feature that was in huge demand from the Sony Vegas editing community, and Sony Creative Software delivered! The FX Masking / Shape Masking are also great additions to the software. A somewhat simple feature can make a world of difference. These features will help to save time upon useless masking on video clips and also allow for an easier integration of video FX, that will be easy to use and yet still fulfil their duties by having a noticeable effect on the video project. Layer Dimensionality Video FX was something I always wished that Sony Creative Software would bring into Vegas. It opens up a new world of editing. It allows you to create the appearance of depth when using graphics and video clips. This feature will be very useful when creating 3D text, which could not previously be created within Vegas without using a third party plug-in or external programs. As mentioned on the SCS website, this will also allow for the creation of realistic shadow, glow and embossing effects with picture-in-picture effects, which is something else I’m looking forward to using it for. MORE SONY VEGAS – Click Here ! Will Sony Vegas Pro 12 be Mac Compatible on Release Date?